Goodwill Matric Higher Secondary School, Manamadurai has advertised in THE HINDU newspaper for recruitment of PGT Teacher jobs vacancies. 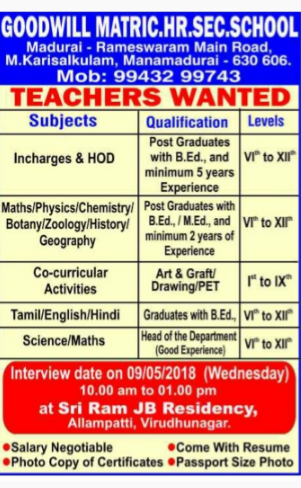 Interested and eligible job aspirants are requested to attend interview on 9th May 2018. Check out further more details below. How to apply: Interested candidates may attend interview with resume,photocopies of certificate,passport size photo. Time: 10a.m to 1p.m Venue:Sri ram JB residency,Allampatti ,Virudhunagar.